Excited about the new Minions Movie? 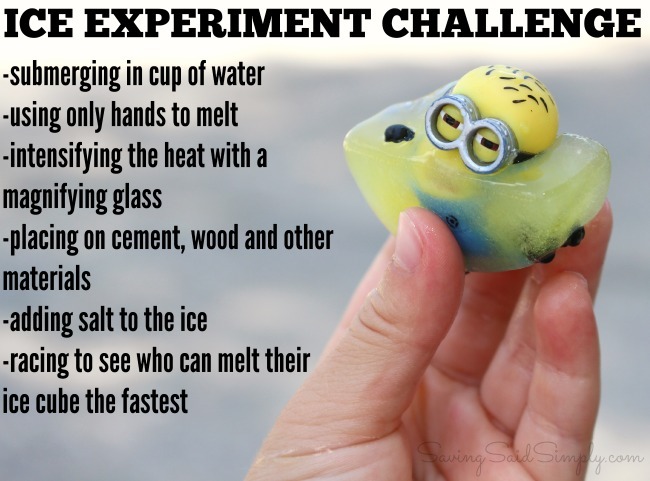 Then your kids are going to LOVE this easy Minions Kids Activity, featuring a fun ice experiment! Bananas have trapped your minion friends and need your child’s help. Rescuing minions from their favorite food, bananas, has never been so much fun! 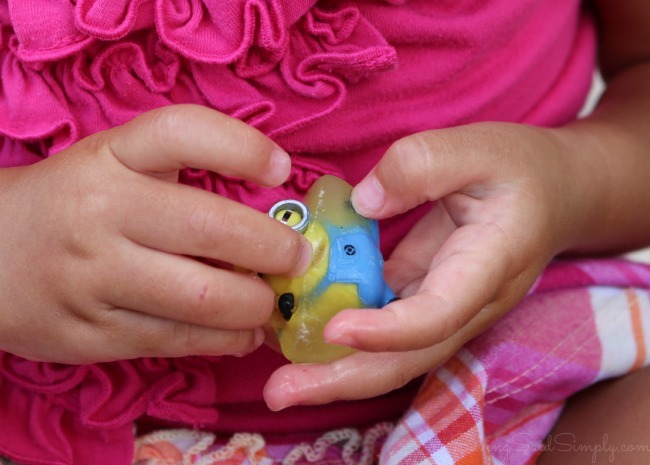 Your kids will love the hands-on sensory activity and science experimentation rolled into one and I know that parents will love pulling out this kids activity again and again, especially so we can cool off this summer 🙂 Check out what we used and how to make the most of this minions activity! Minions trapped in bananas, you say? How will your kids save them? A fun activity for all, your kids will definitely instill lots of hands-on learning and giggles with this homemade science experiment. 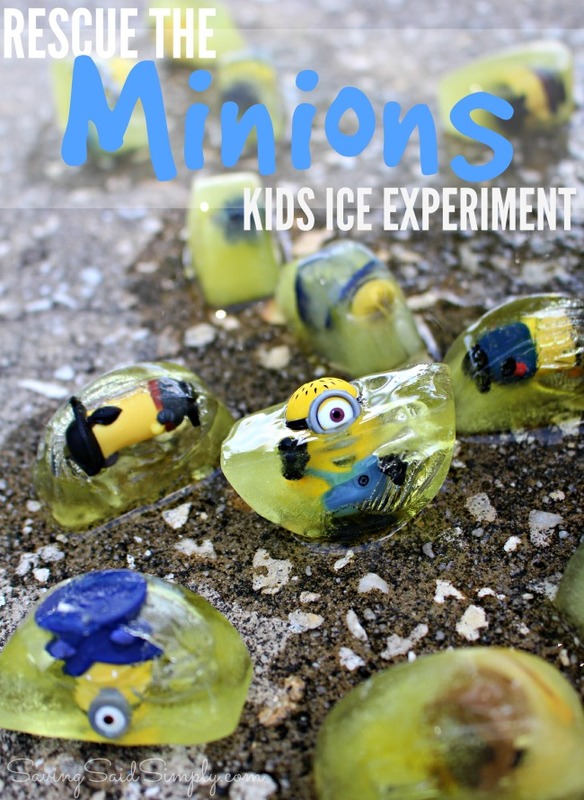 If your kids are as excited as mine for the new Minions Movie this July, I know they will absolutely LOVE this ice thawing project. Ice Cute Tray (Dollar Store) – BONUS if the cubs are shaped like the usual bananas! Micro Minions Action Figures – I got these cute playsets! OPTIONAL: Yellow Food Coloring – to make your banana ice cubes yellow, of course! 1. 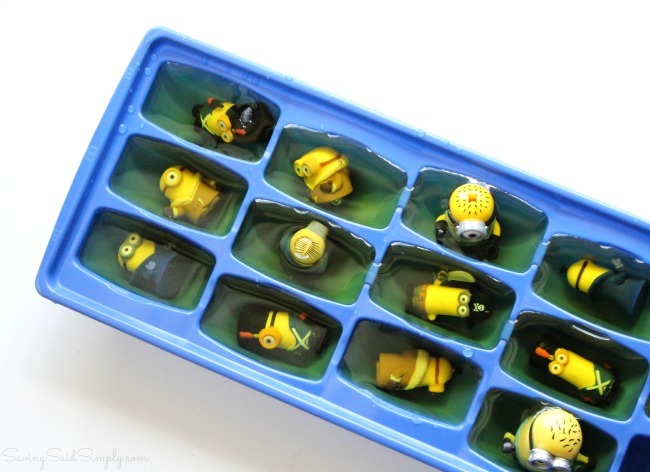 Place your micro minions action figures in the hollowed out sections of your ice cube tray. 2. 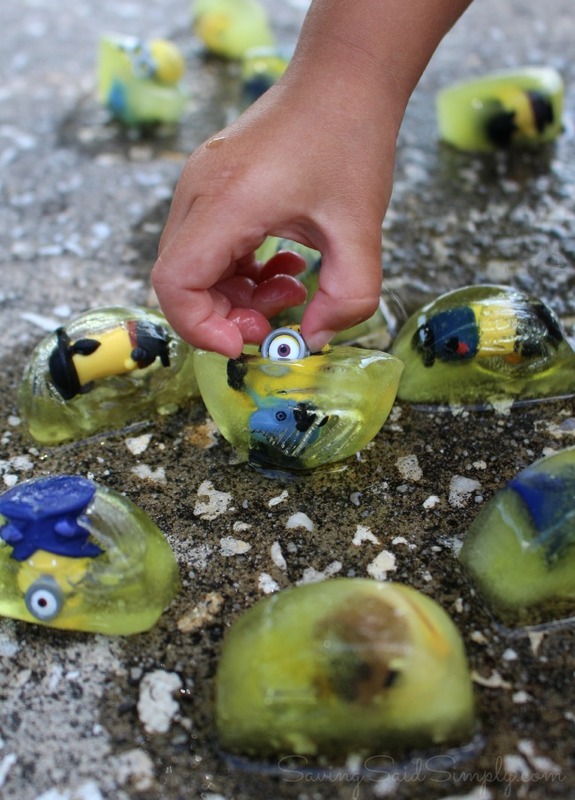 Pour water (using a drop or two of food coloring if desired), covering the minions. 3. Freeze for about 2-4 hours. 4. 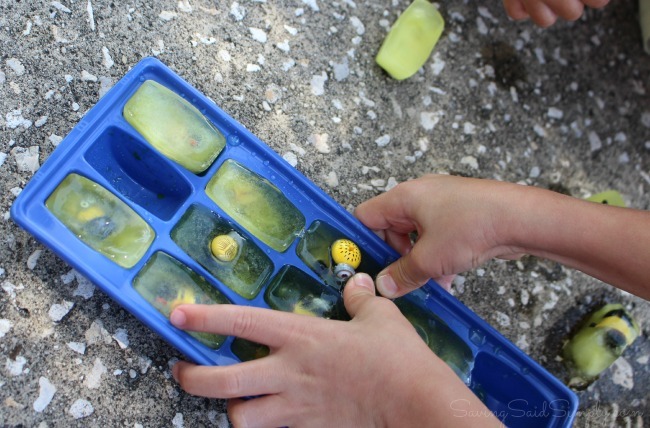 Take your ice cube tray outside with your littles. Allow them to discover, pull out, touch and melt the banana “popsicles’ to rescue their little minion friends! Hands freezing cold, grins from ear to ear and the surprised faces of new minion toys, my kids loved their afternoon of Minion Activity! And now, we are all MORE excited for the anticipated Minions Movie on July 10th! Looking for more Minions ideas? 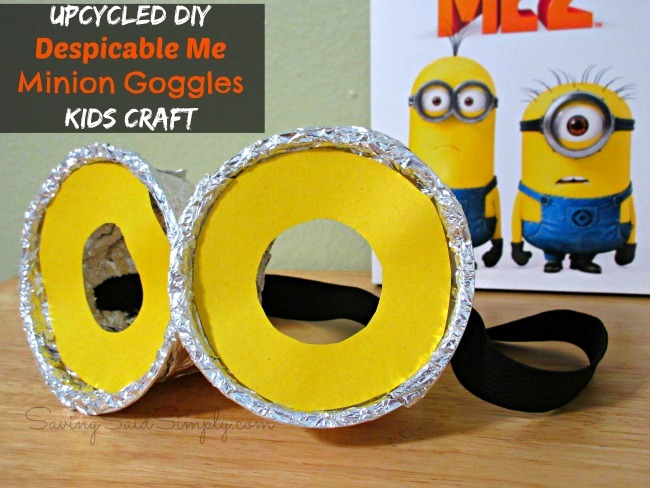 Check out my Minions Googles Kids Craft & Despicable Me Minion Munch Recipe! How are you getting your kids ready for the Minions Movie this summer? May contain affiliate links. Be sure to follow Raising Whasians via Facebook, Twitter, Google, Instagram, Pinterest and YouTube for more FUN kids crafts, easy family recipes and more! This is such a cute activity! And I really like all the different ways to get the kids involved. My family keeps watching the Minions movie trailer over and over! We’re all excited about seeing this movie. This is so cool, my kids would love this. What a neat idea! My grandkids will love this. We love our minions, we have been loving all the minion stuff lately, the new movie previews, toys, Tic-Tacs, and printables. My kids our minion fanatics. What a fun experiment for a warm day! What a fun experiment, it’s perfect for the summer time. Thank you for sharing this post. 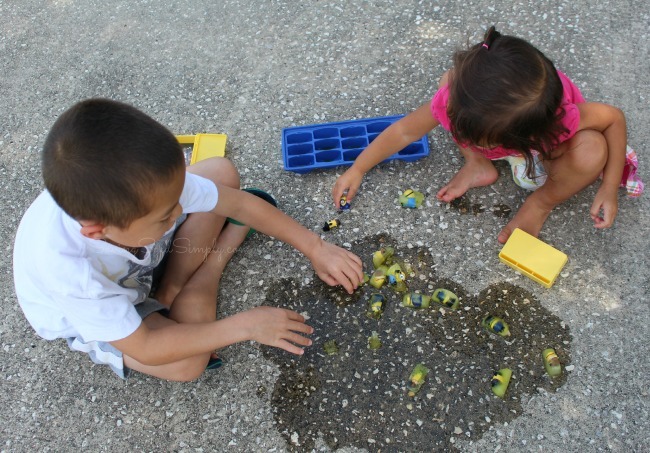 great way to introduce science activities into summer activities! This is such a cute and fun idea, especially for summer! My grandsons would love this and would be so excited about the little minion figures! What a neat idea. This will be a great activity for my grandson to do. He’s going to love it. These are so fun! We can’t wait to see the movie this summer, the preview looked too cute! What a fun activity for the kids. we love the minions. my daughter likes to collect them. 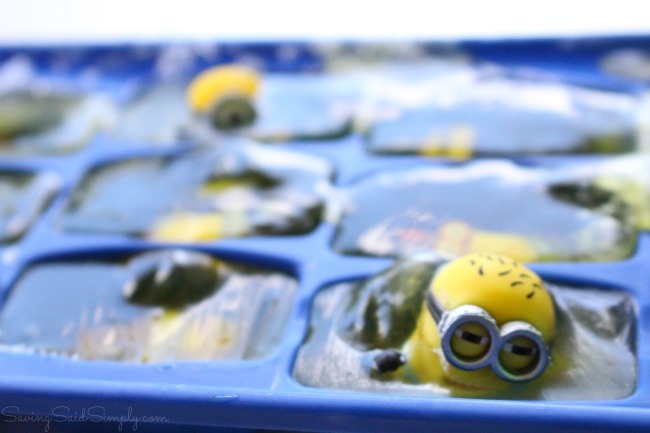 I love the Minions, so of course, I love your minions trapped in the ice DIY ideas. Alas, my son is an only child and is going to be 26 soon, so I doubt he will play. I had hoped I would have grandkids by now, but I will tuck this idea away for when I do have grandkids. This is a fun activity to do with the kids. My grandson loves the Minions. How fun is this! I have a friend who loves minions and she’s planning a minion party. I’m going to share this idea with her! This is awesome! What a unique idea. My grandchildren will love this. Thanks so much! This would be a good game for any kid that loves the Minions!! Very creative!